I remember the night that I heard that Pope John Paul II had died. It was a Saturday night, April 2nd 2005. We were watching Buffy the Vampire Slayer on Silverbird Television (Actually my sisters were watching and paying attention and I was asking all sorts of distracting questions ‘What’s happening now?’ ‘Who is this person?’ ‘What do you gain from this demonic show?’ ‘Who did they just kill?’ You know the likes of those). Then Silverbird TV stopped the program to deliver the breaking news that Pope John Paul II had kicked the bucket. I still low-key blame Buffy and co, I dont know why though. I cried like I had just lost my biological parent! I thought to myself : This was not part of my plan. He wasn’t supposed to die! How was I now supposed to achieve my goals of meeting him? I knew I couldn’t go to Rome until I was grown up but I had just recently heard about ‘World Youth day, an event where the Pope met with Young Adults which was taking place in Germany that year. I was praying that in the nearest future, the event would be hosted in London because then my family can just go visit my grandmother and we can just casually attend World Youth Day events and meet Pope John Paul II. Side Note: That was before I learnt the actual reality of attending the event is not that simple, it’s usually packed with millions of people and you get the tickets ahead of time etc. Actually the Archdiocese of Vancouver is sending people to World Youth Day in Poland 2016 and the hotels had been booked since 2014 and a lot of people paid the deposit for the Archdiocesan package in 2014..It’s so much more than just going to London and showing up to the event. Anyways, all that didn’t even matter anymore because he was dead and so were my dreams. 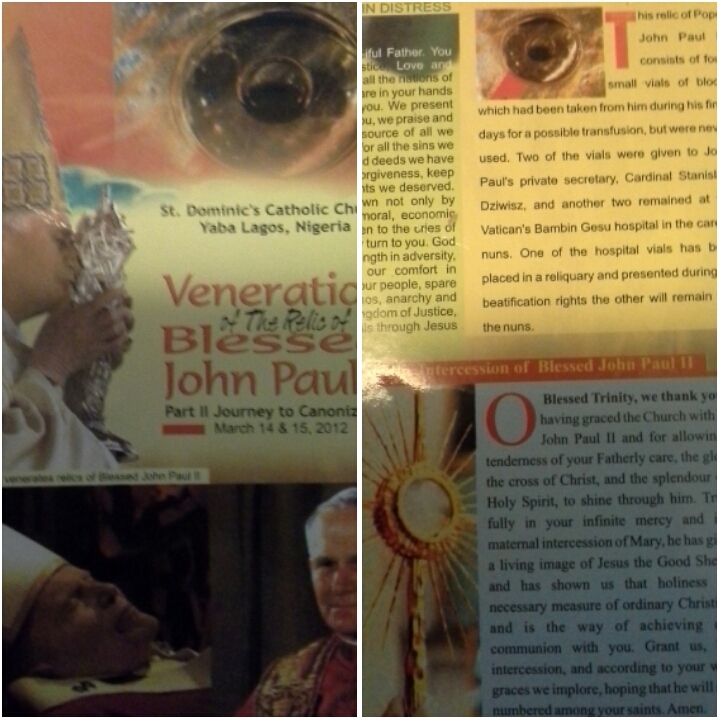 I remember the day that I heard that the relic of Blessed Pope John Paul II would be coming to us. It was in March 2012. I was a mechanical engineering student of the University of Lagos, in Nigeria. Back when, I was in secondary school, I had discovered biomedical engineering and I decided that was the field that my future lay. It was a perfect way to combine my love for biology, physics, math and my desire to help people rather than being a reverend sister who was a computer scientist and medical doctor at the same time. Biomedical engineering seemed more realistic, however, it was not offered as a first degree course in Nigeria which to me was a challenge. When I let my dad know about this, he didn’t see how that was a problem, his solution was very simple, “Get your first degree here in Nigeria in a related field and I will send you abroad for your masters in Biomedical engineering. I dont have any money to send you abroad to do a bachelors degree”. Sounds like a plan, right? But I didnt think so. I believed that your first degree forever defines you so I decided that somehow, someway I was going to get my biomedical engineering bachelors degree. I finished secondary school in 2011 and I later enrolled in Mechanical engineering at University of Lagos, UNILAG and I also attended Global International College for SAT lessons, a compromise that my dad and I had reached. I had originally wanted to go to London but the costs were too high and the scholarships were too few. America ‘the land of dreams’ on the other hand had various scholarships so I started to do my research into American universities. I would not lie, it was exhausting pursuing studies in two educational institutions but it was a life that I chose for myself so I could not complain. I think I eventually wrote SAT in late 2011 and SAT 2 on a later date so I was able to attend UNILAG full-time without much distractions in 2012.I was still trying to find my way out. At a point, I even wrote a letter to MTN Foundation(my future dream workplace) but they said that unfortunately, they don’t give scholarships for studies abroad. On Thursday March 15th 2012, the day before the scheduled visit to the St John Paul II relic, I went to my early morning lab as usual. After my lab, one of my friends B came to tell us that it wouldn’t be possible to see John Paul II tomorrow as we had planned because his relic would be leaving St Dominic’s that evening for Divine Mercy Parish in Lekki. She knew this because her family attends Divine Mercy parish and her mum had called to let her & her sister know that they could come home and go to see the relic at their home parish. Also, my friend had followed her sister and friends to St Dominic’s first thing that morning because they had scheduled their own trip for Thursday and she had confirmed that Thursday was the last day the relic would be at St Dominic’s. When I heard this news, I was crushed and I also felt betrayed but on the other hand, I was grateful that she had found out and let me know earlier. Imagine what would have happened if I had gotten to St Dominic’s on Friday and found out there was no relic! There was also a minor issue, the reason why we had planned the trip for Friday was because of our schedules. On Thursdays, we had engineering lab in the morning and physics lab all afternoon. So there was no free time on Thursday. On that day, I made a decision that shocked my friends and even myself, I decided to skip my physics lab and go to mass at St Dominic’s on my own. 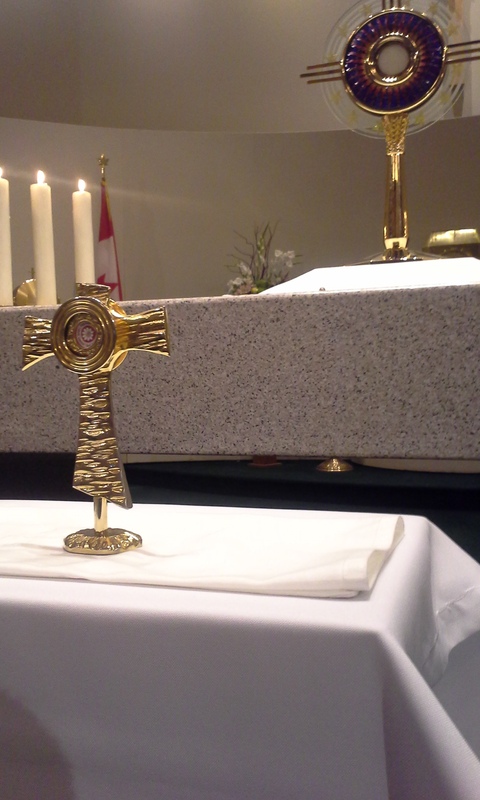 It didn’t mean that much to my other friends to see the relic but to me it was very dear to me. I sent a message to my lab partners that I was sorry that I had to leave school urgently(we had seen each other at lab in the morning so they knew I was around) My roommate called me a cab man and we negotiated the fares and he was to drop me off at the Church and come back to pick me when I contacted him to come back. I texted my family members and let them know that I would be going to mass and finally meeting the relic of St John Paul II and they should send me their prayer requests. I prayed for my family members intentions, my dad’s case and for me to find a way out of UNILAG and study biomedical engineering. One of my favorite memories that day was meeting my late grandmother’s close friend in the crowded church. She was so surprised to see me and asked about my parents whereabouts and I said ‘they are at work’. Then she asked how I got there and I replied that I had used a cab and she gave me money for my cab fare. That to me was a confirmation that God wanted me to be there and an answer to a prayer that I hadn’t even vocalized. That day was indeed one of the happiest days of my life because I had total faith that even though he was Blessed John Paul II at that point, he would pray for me and God would answer my prayers. I went back to school and collected the physics lab data from my group partners and did the report alone because I felt guilty for leaving them hanging. A couple of my friends were apparently worried because it was a huge church and they were like ‘what if the cab guy had kidnapped me or something?’. Lol. Praise God that nothing bad happened to me! I can also testify that my requests that I prayed for that day were granted. My dad won his case and in May 2012, I won a scholarship to study Biomedical Engineering in Canada from Luz Neema Foundation. The scholarship story is a funny one because it literally came up from nowhere. One day, I was reading the newspaper and I came across an interview with a woman who was sending 5 people to Canada on a 40,000 dollar scholarship. I showed my dad and we were wondering why we had never heard about it, if she was for real, if she had a hidden agenda etc. I think everyone can agree with me that it sounds too good to be true. Nevertheless when the application forms came out, we bought the form and sent in my WAEC results (WAEC is an exam that most students in final year of secondary school in West Africa write) which I was very proud of 5As and 4Bs. I think the application said you must have passed waec with 7 credits including Maths and English or something like that, so I was sure that my results were good enough! I dont remember the exact date I heard about the scholarship but I think it was before I saw the Blessed John Paul II relic. We did the final interview in May 2012 and I eventually was the best student. (Only girl who took part in the final and I was the winner by merit, who says it’s a man’s world?) Then they said that we would start to work on my admission to a Canadian school but God had already got that covered. Back in 2011, when I was exploring my options, I went to a lot of educational fairs with my dad. On a particular day, he had somewhere else to be so I went with Aunty J, who worked in my mum’s office and was a recent university graduate so the fair was a way for her to check out postgraduate options abroad. I applied on the spot to a school called Fraser International College and to show how little we thought about it, Aunty J signed as my guardian. In a day or two, the college sent me an admission but I didn’t think much about it afterall there was no money to go. When I won the Luz Neema scholarship, we simply contacted the school and they deferred my admission to January 2013 as requested (because Luz Neema told me my visa might not be out by the time school started in September 2012). It’s funny how God works eh? Honestly, it all felt like a dream and it did not dawn on me that my dreams were coming to pass until I landed in Canada. It was all too good to be true and I still hadn’t figured out what the catch was with the scholarship people so I was very wary.Here’s a video of the interview process, notice my reaction at 5:50 when I was told that I had won the scholarship, LOL. No screaming, no tears of joy, no drama. Just plain disbelief! I remember the day that I felt that St John Paul II had betrayed me big time. It was the summer of 2014. I had come to the conclusion that I could no longer become a biomedical engineer due to my poor grades. I was confused, angry, betrayed, frustrated. ‘Why did God bring me to Canada if he was going to leave me alone?’ ‘Why did St John Paul II stop praying for me?’ ‘Why did God make me start something that I couldn’t finish?’ ‘Why was I working my brains off and not seeing any results as opposed to when I didn’t put in that much effort and I still excelled?’ ‘Why was I consumed by loneliness while surrounded by so many people?’ ‘What had I done to deserve this?’ ‘What did I do wrong?’ ‘Wasn’t it better for me to die rather than facing the shame of going to tell my dad that I had let him and everyone down?’ Why me? Why Why why?? When I first came to Canada, I used to go to St Helen’s parish but after a while I switched to St Mary’s parish(that story is a blog post on it’s own) but one of the things that I love about St Mary’s is the banner/poster of St John Paul II in front. I have always felt like it was a reminder to me that he was still with me and praying for me in my journey in a strange land. When things started to fall apart, I consoled myself that God would never leave me and St John Paul II was also always with me on my journey. However when things eventually fell apart, I didn’t know if I believed that anymore. After a lot of reflections, conversations, thinking, tears and roller coaster feelings, I have come to the conclusion that God is indeed always with me, they say the teacher is always silent during a test. Be not afraid Fehintola, although you might be interested in only the destination, make sure that you take full advantage of the journey. Learn from your mistakes, celebrate your victories, live in the present, laugh, cry, miss home, make friends, discipline yourself but ensure that you also have some fun. Be not afraid, be not afraid! Sacred heart of Jesus, I place my trust in You!